So far I have said nothing about weddings I perform on the other side of the island. Some of the most beautiful, and most private weddings I have done are at villas in the Cayman Kai area. The advantage here is that you get a truly private beach, once you are staying at the villa. 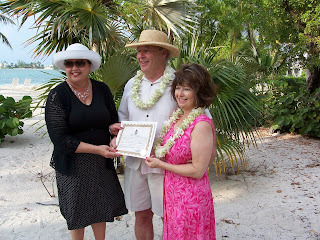 This was a lovely wedding in the sand-garden at one of the Villas of Cayman Kai. Here is a set-up for a larger group wedding. These weddings were all at villas, but I have done several weddings at the Kaibo Restaurant as well. If you don't want to get into a lot of expense, but you still want a quiet event with perhaps dinner afterwards, there is a public beach at the Kaibo which is very scenic, just over from the restaurant. Of course my favourite spot on this side of the island is Starfish Point. I don't have any pictures of this spot right now, but it is really spectacular.